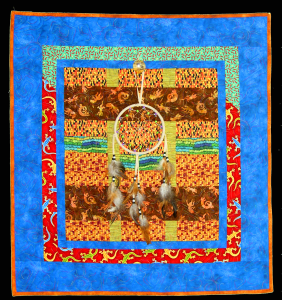 Prosperity Peacock – a quilt filled with Feng Shui symbolism for wealth and prosperity. Original design by Dale Domingue. Please click Here for quilt details. 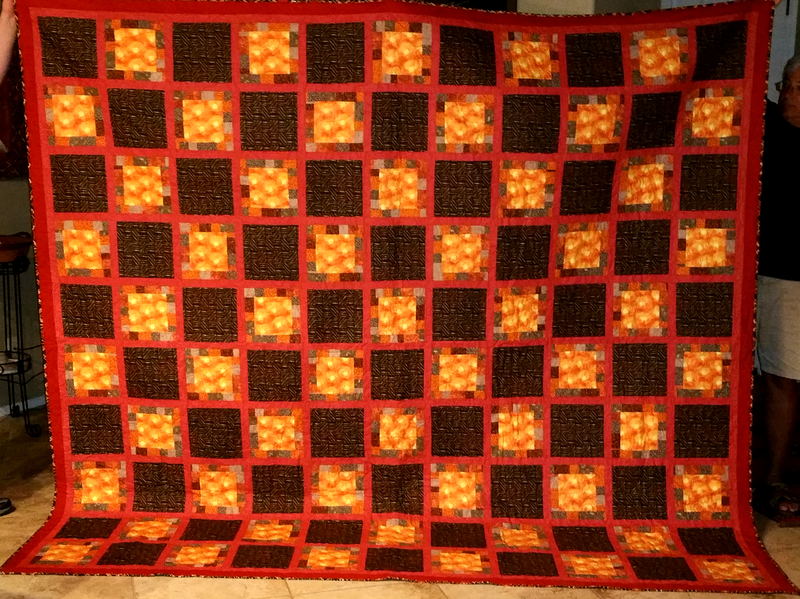 Click Here for photos of quilt details. 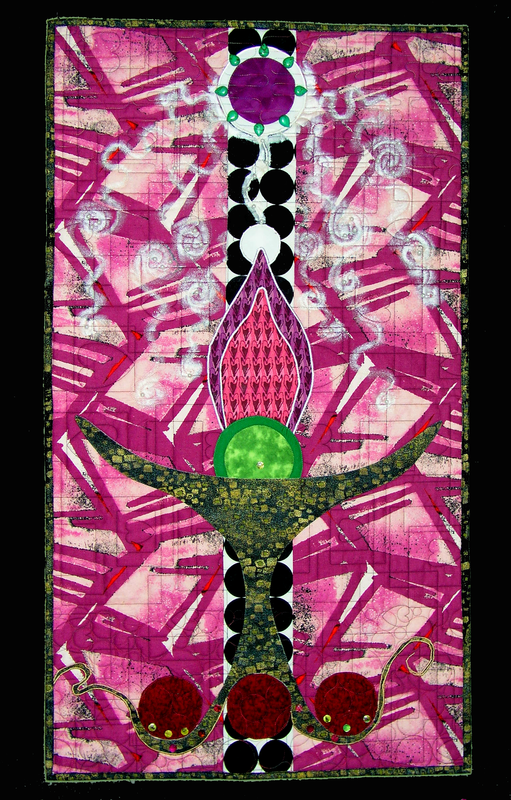 A Feng Shui inspired quilt incorporating many symbols for Wealth and Properity. Original design by Dale Domingue. Metallic thread quilting, Swarovski crystal embellishment. 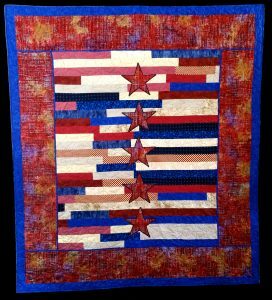 A combination of Wealth & Prosperity and Balance quilt to enhance your personal life intentions, using the art and science of Feng Shui. 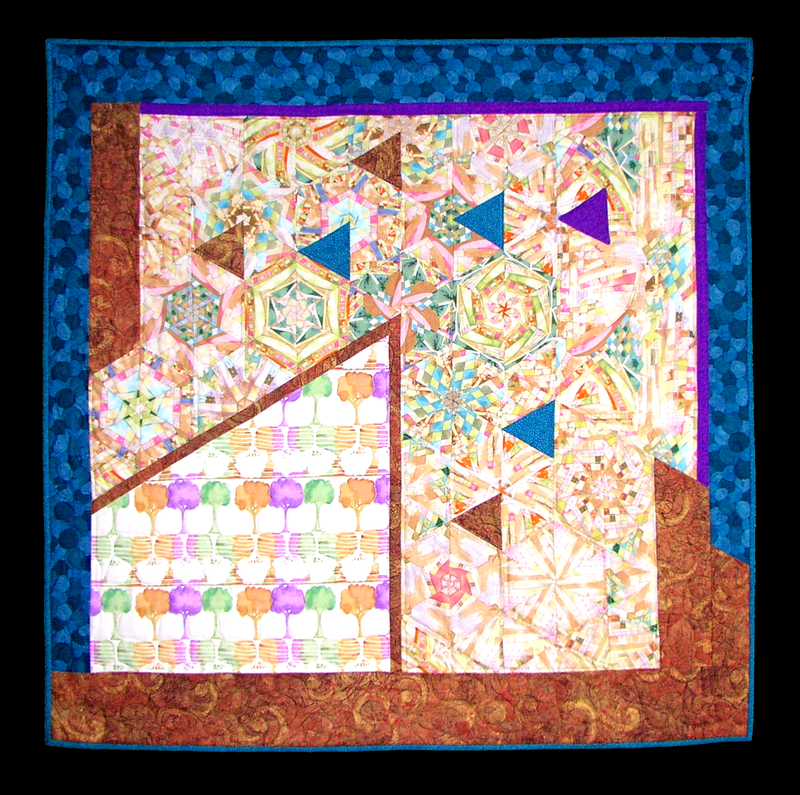 Piecing, applique, Swarovski crystals, metallic gold quilting. 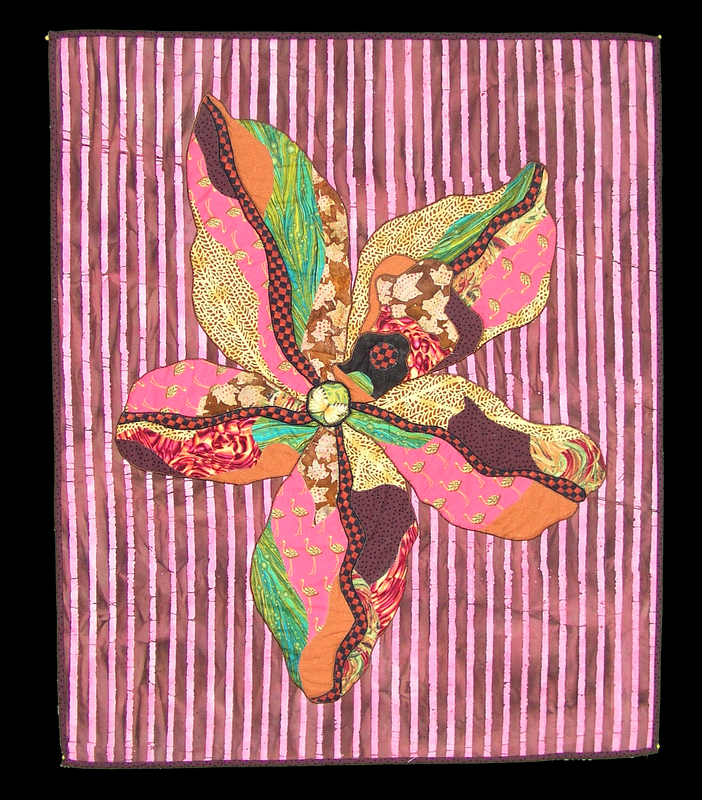 Prosperity symbolism in the crystals, gold metallic fabric and thread, color purple. Balance symbolism in red for root chakra, stones and roots of tree, small round stone-like quilting balanced by airy swirls and arcs. Wood and Earth elements represented. 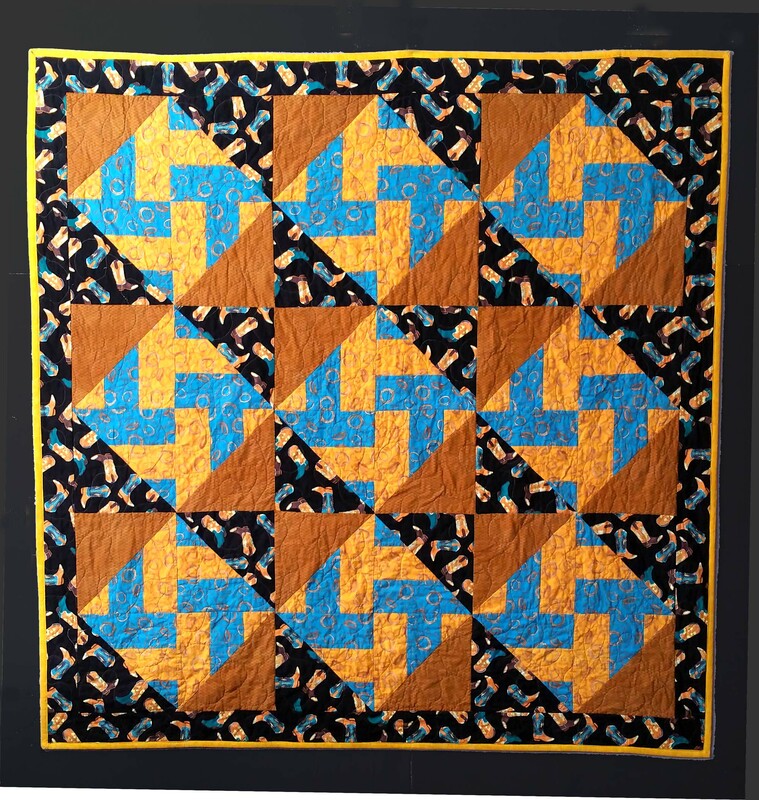 This quilt is the outcome of an exercise I did in intuition. I stilled my mind and intuition said to 1) piece the fabrics randomly, cut up the result and repiece differently and 2) add a 3 dimensional aspect. 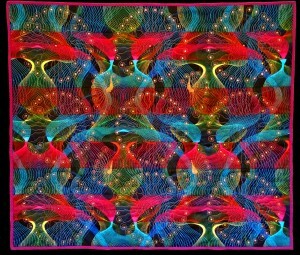 I then worked without conscious decisions; working instinctively through intuition. Toward the end, I had the 2 yellow pillars on the right which called out for something to be on t…hem. I thought of yellow for “solar plexis chakra” or the essence of who a person is. Lips to represent a face is what immediately came to mind – so 2 pair of lips sit atop the pillars. 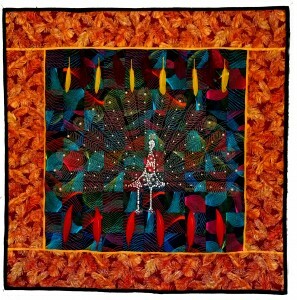 ONLY THEN did it occur to me that my “Two Lips” quilt was constructed from tulip fabric!!! Isn’t it wonderful when we let our inner wisdom guide us! 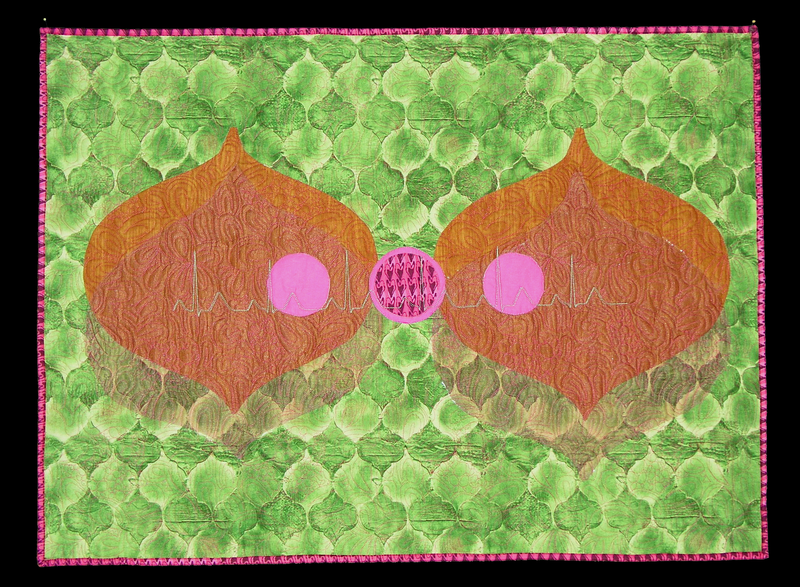 Pink circles and pink stylized heart fabric represent the love and partnership gua in Feng Shui. 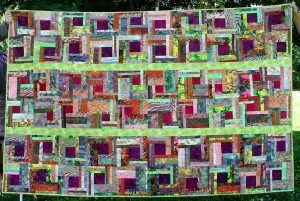 The overall quilting is also done in pink thread. There is a subtle heartbeat rhythm applied in green “thread painting.” Green corresponds to the heart chakra. Binding is in the stylized heart fabric. 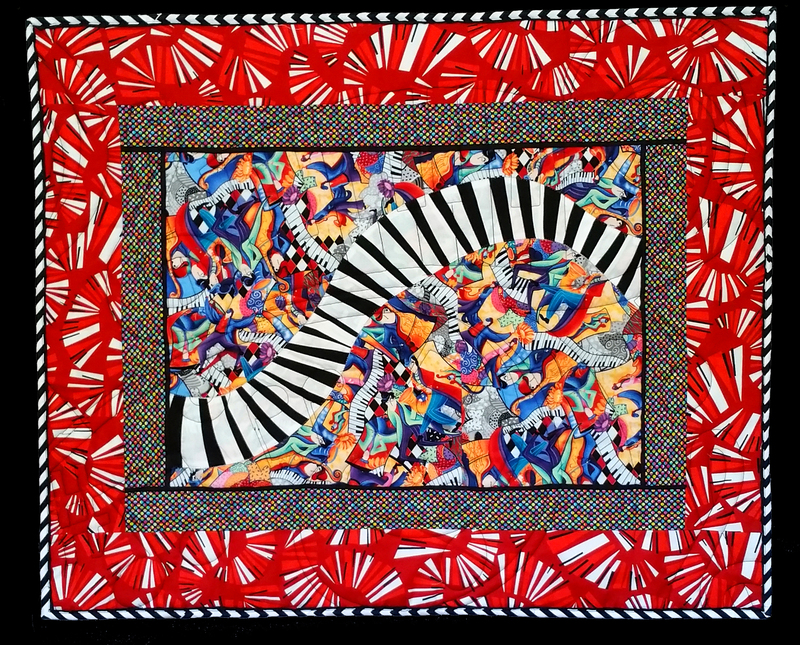 This quilt would be appropriate for the bedroom or love/partnership gua in Feng Shui. 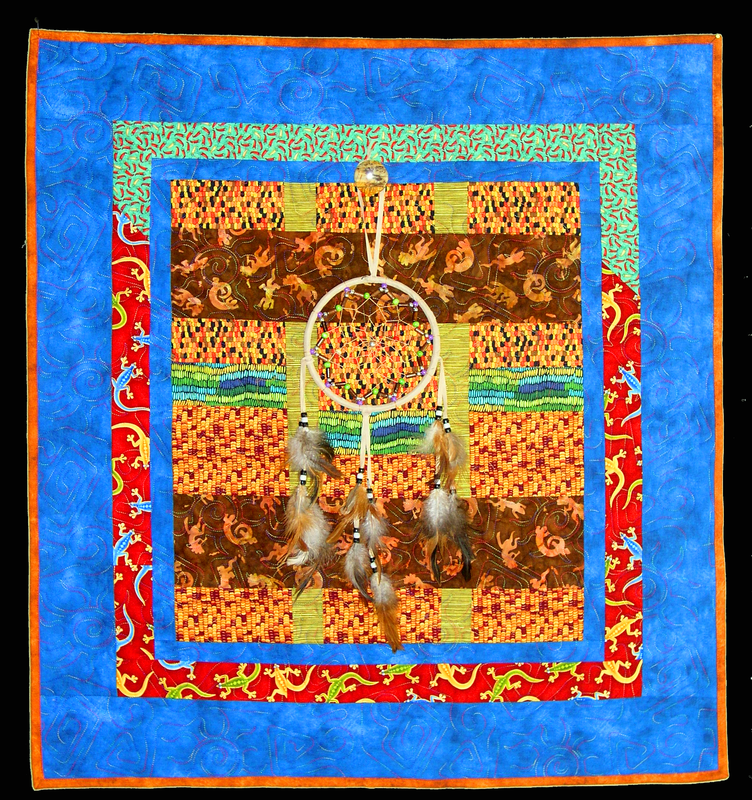 Southwestern style wall hanging coordinates with Indian Corn Blue king bed quilt, also available (2nd version; 1st version already sold). Original design by Dale Domingue. 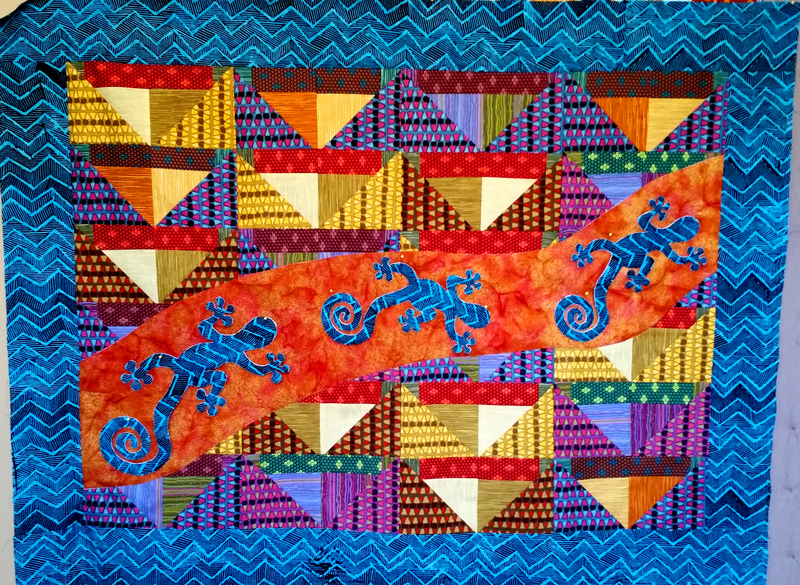 Path on which geckos travel is a textured cotton fabric actually dyed using sand! 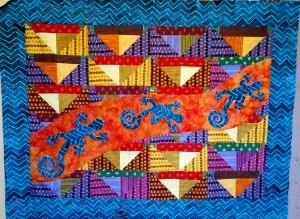 Click Here for photos of quilt detail. 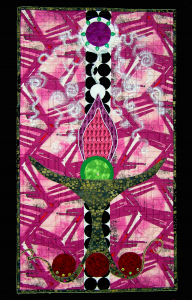 Jazz Piano, a music themed art quilt. Fun, whimsical, uplifting wall quilt. Original design by Dale Domingue. 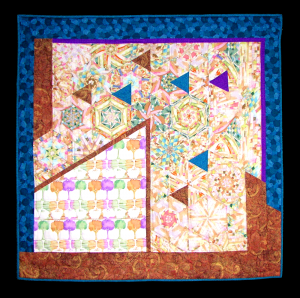 Piecing and Applique. 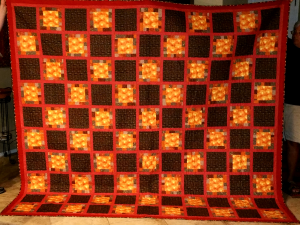 Quilted in black with a music and piano theme. This queen bed quilt features a cream fabric with branches and red berries. 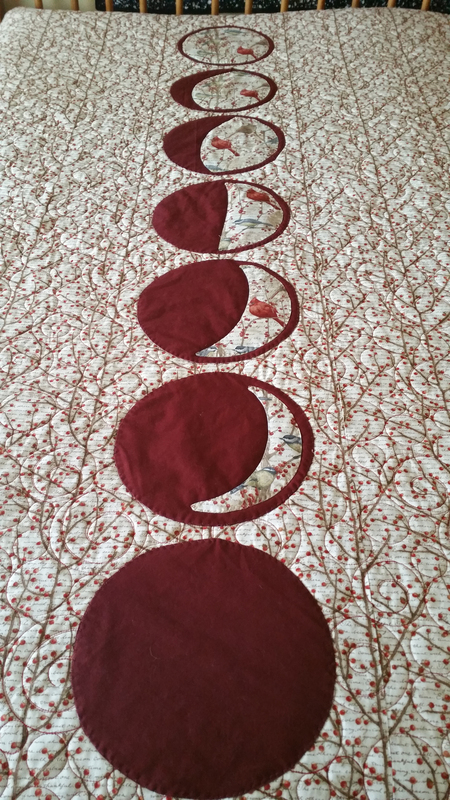 Phases of the moon appliques run in a vertical line off center to the left. A coordinating, feature fabric with red cardinals on the branches is used in the moons. The back is a tiny red and pink check. 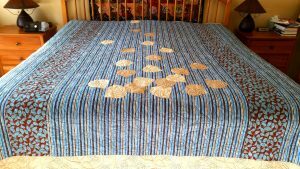 100% bamboo is used in the middle layer, making this quilt naturally warm in winter and cool in summer. 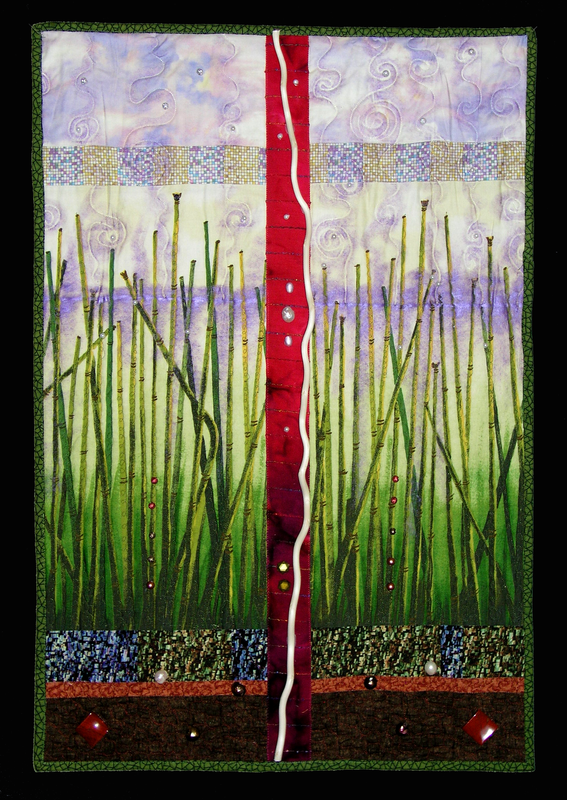 Available for sale at Gallerie Quilts in Evergreen, CO. 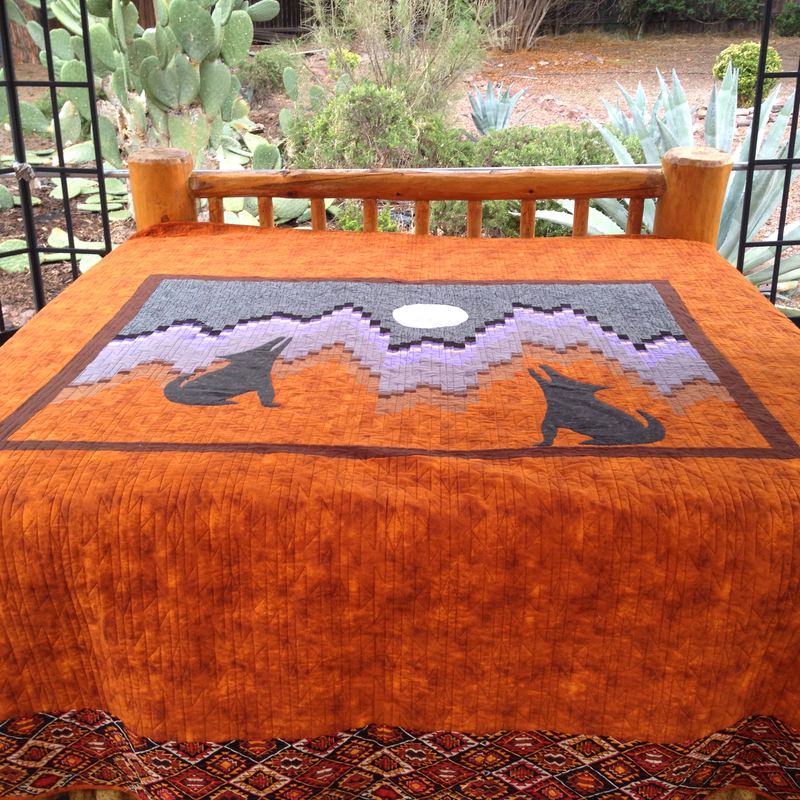 Bright and sunny, this pieced king bed quilt is quilted with a Southwestern style sun pattern. Batting is 100% bamboo, giving the quilt a soft, flexible feel – cool in summer and warm in winter. Appliqued aspen leaves in two fabrics cascade down into a pile in this king bed sized art quilt, designed by Dale Domingue. 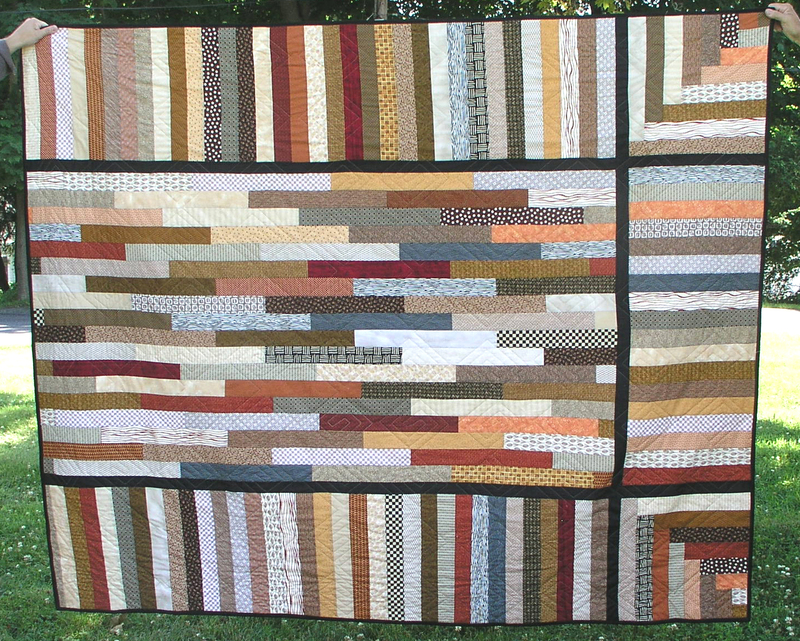 There is a cream border that matches the reverse side of the quilt (see quilt details). 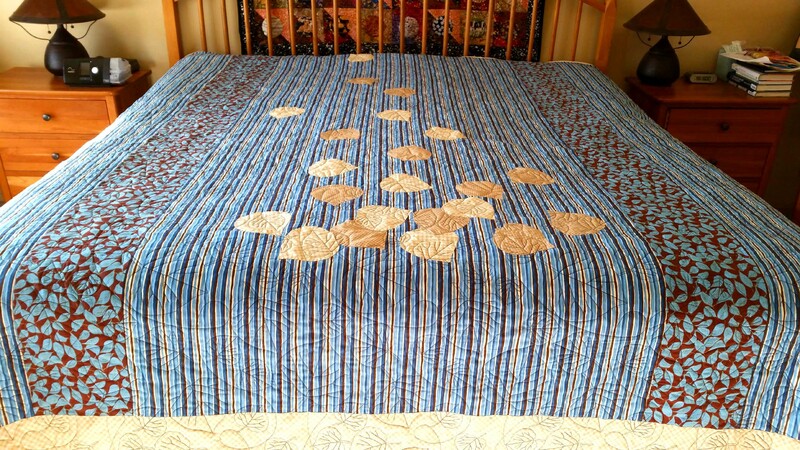 100% bamboo is used in the center layer, making this quilt naturally warm in winter and cool in summer. 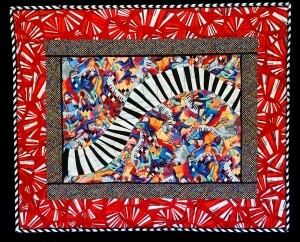 “Red Sun Tonight – Sailers’ Delight” – should be a beautiful day tomorrow when you sleep under this king bed art quilt. A brocade-like deer and woods feature fabric is used in the blocks at the bottom. 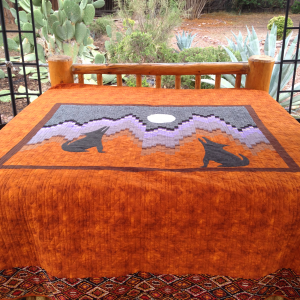 Bargello style piecing creates the Rocky Mountains and an appliqued red sun is setting. An original design by Dale Domingue. 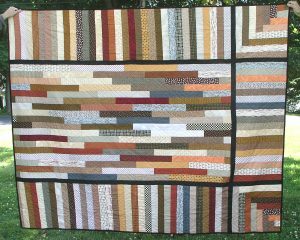 The center layer is 100% bamboo, making this quilt naturally warm in winter and cool in summer. 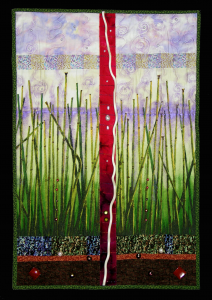 Available at Gallerie Quilts in Evergreen, CO. 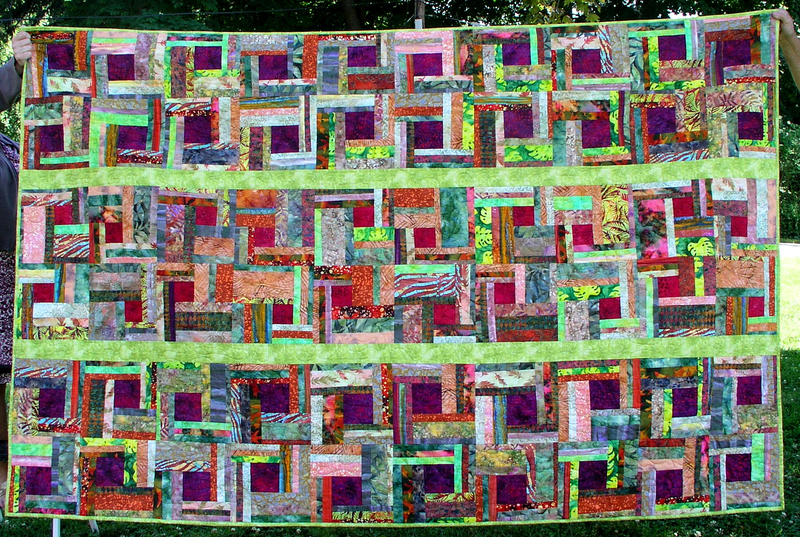 Bright colors in unusual fabrics scatter across this oversized king quilt. It fits easily over the thickest of mattresses, and can even be used as a bedspread for non-pillow-top mattresses. 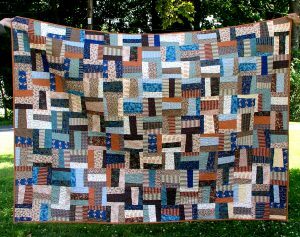 The reverse side of the quilt is the same mottled blue as the border fabric. 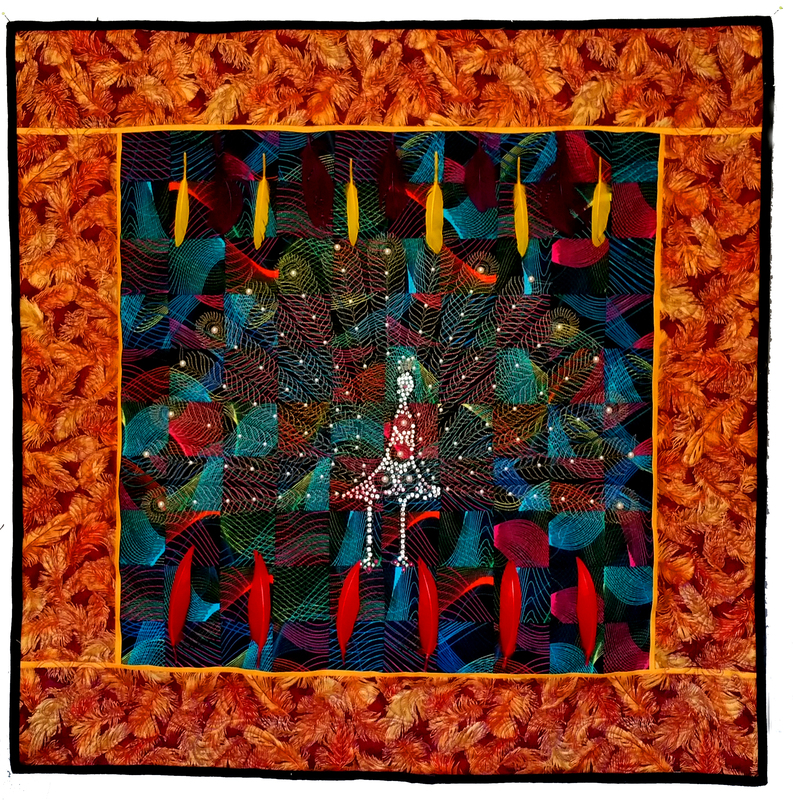 Fantasy Tree is a king bed size art quilt designed by Dale Domingue. A tree trunk runs up the right side with branches reaching across the top. 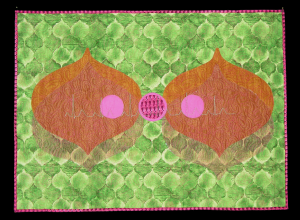 From the tree hand and fall heart shaped leaves in two fabrics, which are arranged as mandalas. The cream centers are the same fabric as the reverse side. 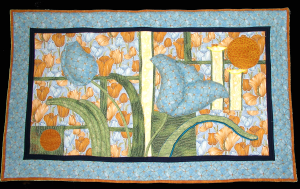 100% bamboo is used in the center layer, making the quilt naturally warm in winter and cool in summer. Bamboo is a little lighter weight than the traditional cotton batting. This patriotic lap quilt is generously sized and features mahogany red, blue and cream. 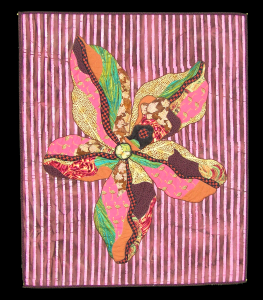 The border fabric, matching appliqued stars and back are batik fabric. The center layer is 100% bamboo batting, making this lap quilt naturally warm in winter and cool in summer. 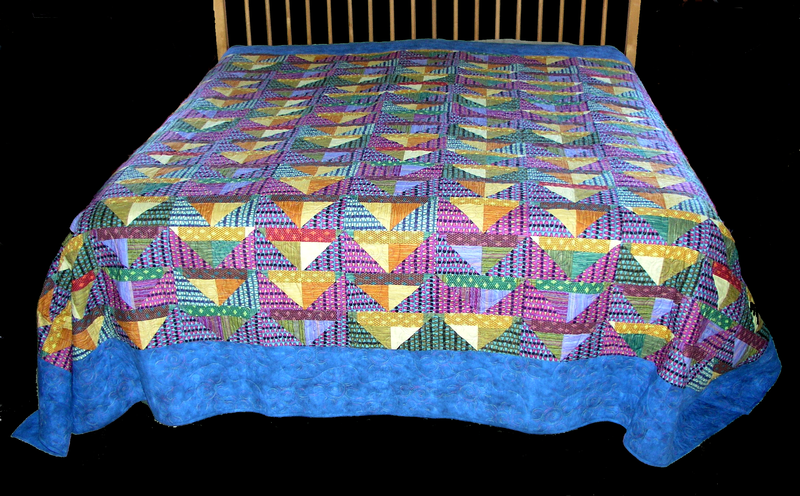 Matched pair of twin bed quilts. 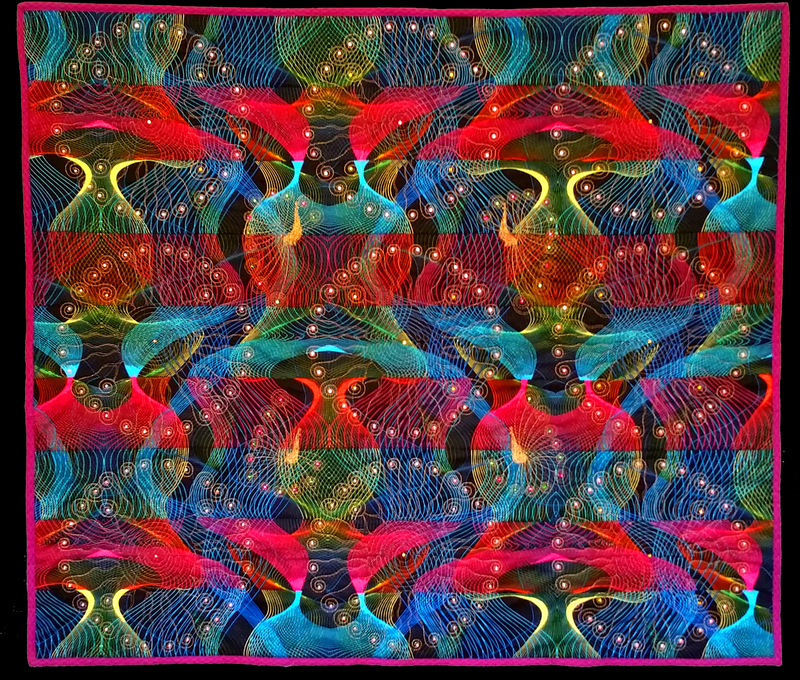 Batik fabrics. Matching dust ruffles and pillowcases available. Matched pair of twin bed quilts. 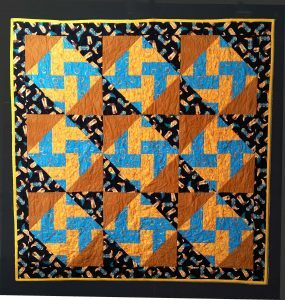 Twin bed quilt in fun, funky blocks in blue/brown theme. Matching dust ruffle and decorative pillowcase available. In photo looks crooked, but IS straight & square! Custom table runners available in any style.